Enriched for Life offers a variety of fun and informative classes for youth, teens, and adults. We offer engaging classes for lifelong learners in many interest areas. During the summer months, we offer popular Sports Camps run by our PPS coaches, drama camps, STEP camps, aquatics for youth and adults, and many of our regular class offerings. 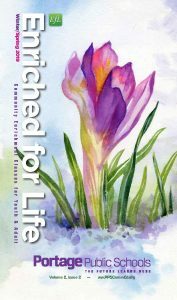 The Enriched for Life course catalog is published in May, August and December. Catalogs are mailed to residents throughout the Portage Public School District, as well as to homes in Schoolcraft, Mattawan, and Kalamazoo. Program fees vary based on the class time and the length of the programs. You can see current offerings and register online at http://www.ppscommed.org. OFFICE HOURS, SCHOOL YEAR: 7:30 am – 4:00 p.m. Mon. thru Fri.
SUMMER HOURS: 7:30 a.m. – 4:00 p.m. Mon. thru Thurs. & Fri. 7:30 – 11:00 a.m.